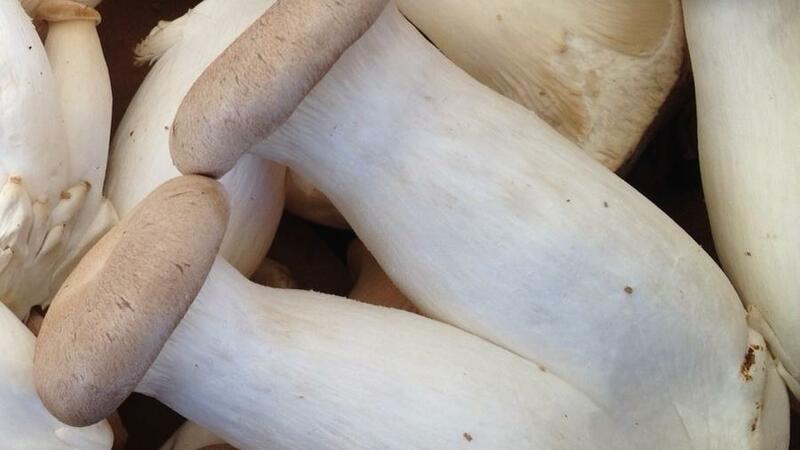 King Trumpet mushrooms (Pleurotus eryngii), raised and sold by Far West Fungi, at the farmers’ market in Menlo Park, CA. “They’re my favorite mushroom. They have a very dense texture,” says farmer Loren Garrone, whose parents, John and Toby, own Far West. How long will it be around? The mushrooms are cultivated year-round in Moss Landing, CA. Make sure the mushrooms are firm, not soggy or squishy. How do you like to cook trumpets, Sunset friends? I’m curious. Still craving mushrooms? We have plenty of recipes.